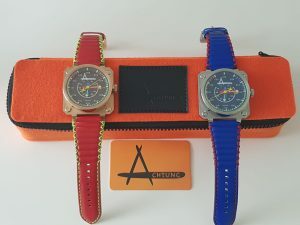 When I was first introduced of Achtung by Ms Rachel from TVG Singapore, I had to google them out because it was my first time discovering about the brand. 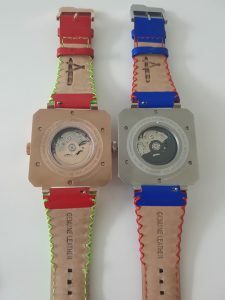 First thing that pop up in my mind was “sigh, another Bell & Ross wannabe” because of the squarish case with circle dial, with the differences only on the colourful dial and hands. Nonetheless, I decided to drop by TVG Singapore to check why Ms Rachel was so excited about Achtung, and I finally understood why ! 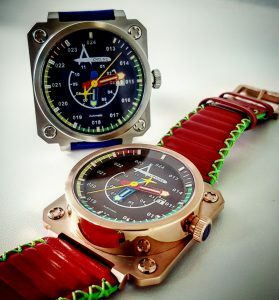 Thanks to TVG Singapore for generously loaning me 2 sets of the newest series Aviatorē (Blue & Rose Gold Brown), and after wearing ’em for a week, I felt an apology is needed to Achtung for classifying them as a “Bell & Ross wannabe” because they may have the same look & feel, but Achtung‘s design definitely showcased a personality of their own – Bold, Adventurous, Attention Seeker, Hyper, Funky, and many other characteristic that can be defined through each of their Aviatorē series. 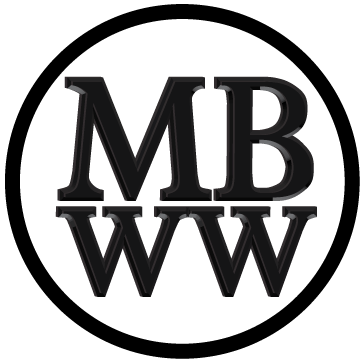 Here is a quick brief introduction about the brand itself. Achtung [ahck-tohng] or [ahck-toong] is a Deutsche (German) word used to command attention, also implying “warning” or “alert”. 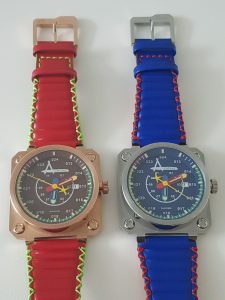 Based on the brand name, it is very obvious it’s a microbrand from Germany, that is designed to call out to watch collectors who are looking for something different without the need to spend a fortune to get one. The case ! It may look oversized, but somehow it fits really nicely on my wrist. The quality of the case is amazingly good even for a stainless steel. The vibrant colours really caught my attention ! 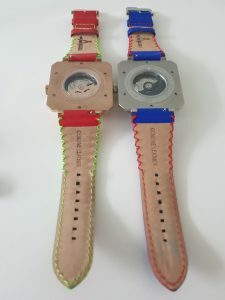 The bright comfy leather strap. Didn’t like the date at 3 o’clock position because it looks clustered with the dial design. I would probably remove it or move it at 6 o’clock position without disturbing the inner circular design. I would have preferred a real screws on the square base. Didn’t understand the concept of 3 digits on the bezel “024, 013, 014, …” If it was meant for speed indicator, I would rather have it display as “24Ø, 13Ø, 14Ø, …” instead. Case : Let’s start with the case shape. 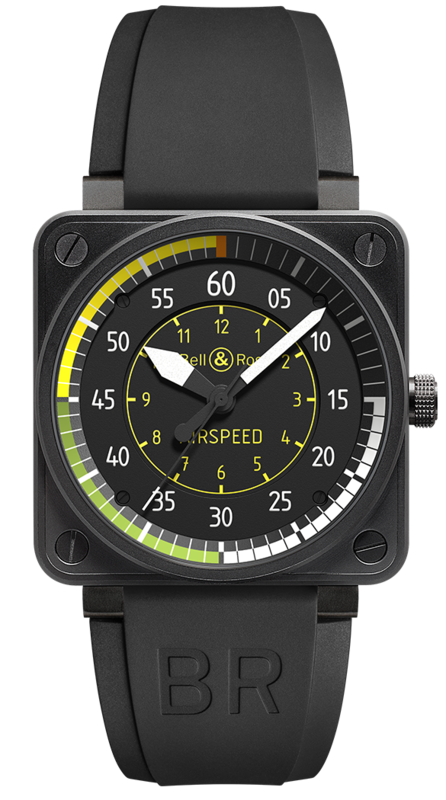 Yes it does resembles Bell & Ross as highlighted earlier and based on my first impression, would have love if it was shaped slightly differently. 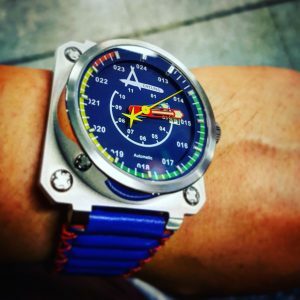 Nonetheless, the quality and built of the case is exceptional-made, with combination of a matte finishing on the square base and polished finishing on the circular cone shape where it houses the dial and movement. Even with its flat square base, it fits very well on my wrist and even on female too. I believe the short and angled lugs does play a part on that. There are four faux screws at each of the corners on the watch’s square base, which are for decorative purposes only. 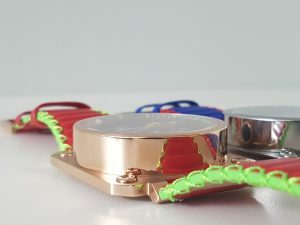 Next is the large push & pull style crown with a engraved brand logo “A”, which makes winding easy and changing of time and date especially with my large fingers. 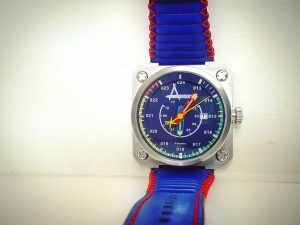 Caseback : It’s an exhibition caseback which allows you to view the Seiko NH35A movement with the branding signed rotor. Surrounding the sapphire crystal are 6 flathead screws on the back of the case that secures the circular cone onto the flat base. 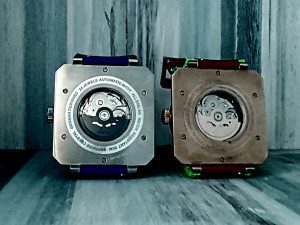 There is an engraving of the serial number assigned to each watch at the bottom right where only 10 pieces are produced for each variation worldwide. How cool is that. Dial : What can I say about the dial. 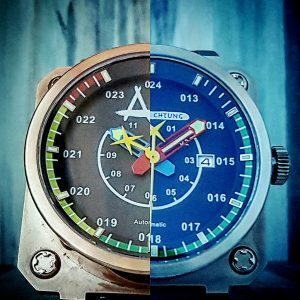 Achtung Aviatorē has a two-stepped dial that is adapted from a true airspeed indicator guage with the highlights of the 3 colours – green, yellow and red that run through an angled hour indicator around the inner chapter ring. 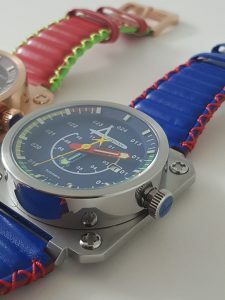 On the center of the dial, there is another semi-circular indicator which offers another set of 12 hours indication, which is somewhat similar to the traditional “fliegers” pilot theme. The hands are definitely an eye catcher for me, because of the colour contrast and design. 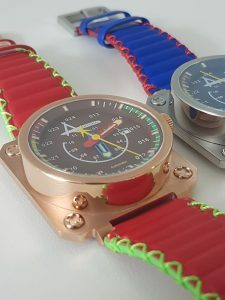 The hour and minute hands, along with the small rectangular hour markers (applied indices on the fixed inner chapter ring), are all painted with Superluminova lume. There is a date feature on the 3 o’clock position, which is not to my liking as mentioned earlier. 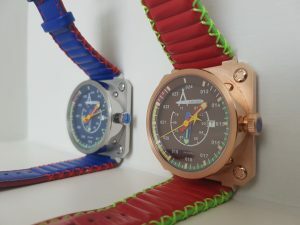 Strap : Quality over quantity, that’s all I can say again & again about this watch. The workmanship on the strap is magnificent. The choice of colours and stitching design couldn’t have been any better. 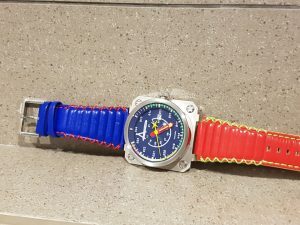 It totally matches the watch case, design and theme. It’s a 24mm genuine calf leather with a combination of tribal stitching from the top to the middle and ends with the traditional stitching from middle to the bottom. 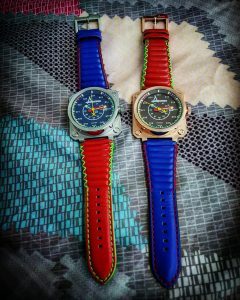 The padded loops or ribbed design on the strap is definitely a classy touch to the overall look and feel of the watch. 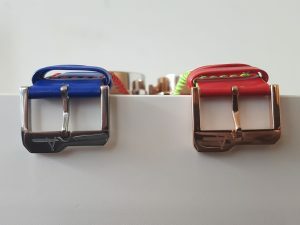 It also comes with a matching buckle and a quick release spring bar. Kudos to Achtung Time to pay so much attention to all these little details. Packaging : It comes in a long rectangular “felt” material bright orange travel case with a black label on top displaying the branding. The zipper is definitely larger than the norm, but it’s also easier to open and close the case. 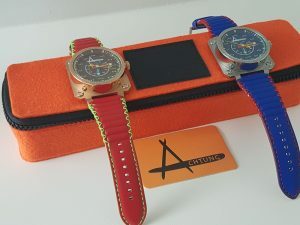 Inside the case is a custom foam that fits the watch perfectly and a card slot where the warranty card would be placed at. 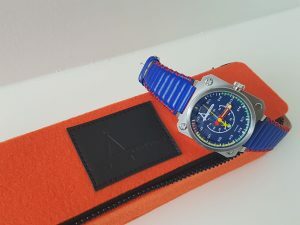 Overall, it’s a nice travel watch case for any short or long trips. 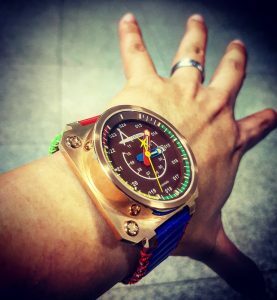 It’s definitely an attention seeker on your wrist. It looks huge, it wears big, but surprisingly very comfortable. 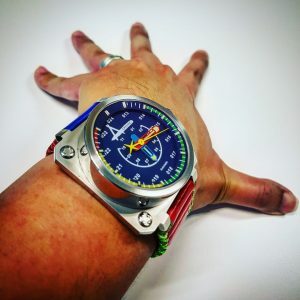 Love the matching colours on the dial, and definitely those cool hands especially the second hand. 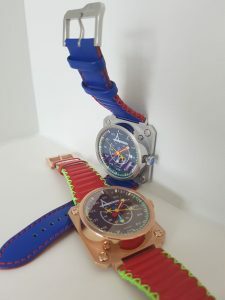 Let’s not forget that every variation comes only in 10 units and knowing that only 9 other people in this world would have the same watch as you ! 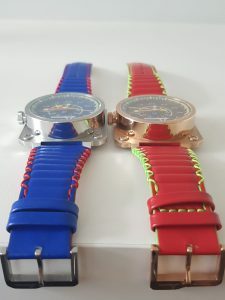 The straps are definitely a class above the rest and I would definitely recommend anyone buying this watch to get an extra strap because you can easily mix & match the watch accordingly. 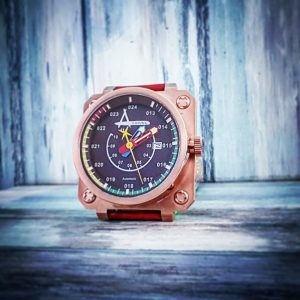 Finally, before I end my review, I would like to thank TVG Singapore for introducing and loaning me the Achtung Aviatorē to review. And lastly, I’ll end this with a quick comparison of Bell & Ross as to why I thought they look alike. 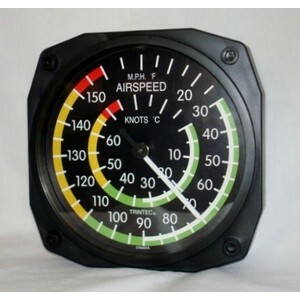 As mentioned earlier, it does resembles a lot like most of Bell & Ross model, especially BR 01-92 Airspeed. However, Bell & Ross to me is more towards conventional and vintage aircraft-cockpit feel whereas Achtung to me is more of reliving the history in an artistic feel and giving vintage a new life for the newer generation to appreciate the past.